After much sanding, the two haves of the Michigan are now smooth. The panel lines need to be scribed and it will be ready for primer (hopefully no more sanding...) and then some paint. 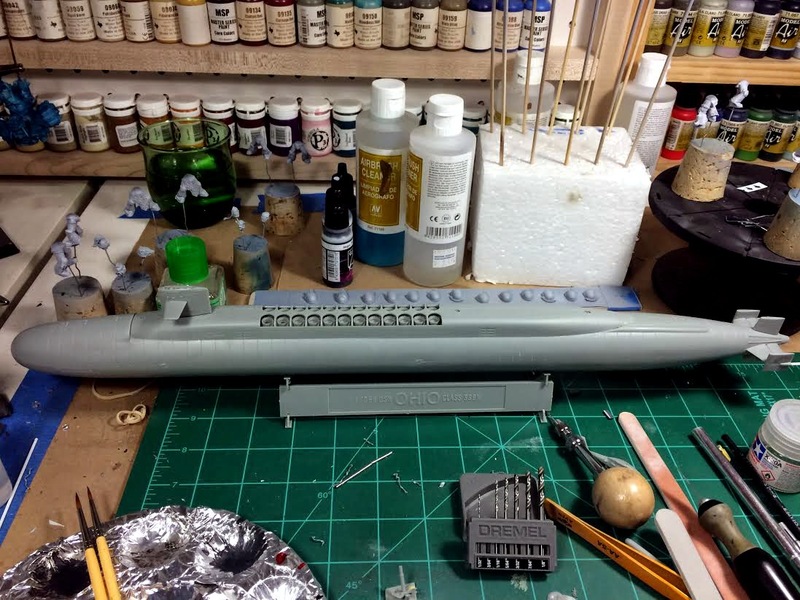 The missile tubes will be white and the hull will be varying shades of black/grey to show the no-slip surfaces and other details. I have a bunch of black and dark grey paints so it will most likely be a combination of Tamiya Flat Black (XF-1), NATO Black (XF-69), Rubber Black (XF-85) with using Light Grey (XF-66) or Neutral Grey (XF-53). The hull below the waterline is red so I will use Hull Red (XF-9) highlighted with Flat Red (XF-7).